In the match for reaching the next stage, our five took a risk and picked Batrider. Moreover, it was the fifth pick and it can be said that it had a decisive impact on the result of the second map. Let's find out more about this hero and the reasons why it brought a victory in that battle. Batrider is a ranged intelligence hero. Despite his low hit damage, he feels rather well in 1v1 situations. He's also doing good on the hard lane. His main feature is flexibility. This hero even if the lane is failed, can easily go to the woods and earn the gold for a key item that is Blink Dagger. Having got it, Batrider becomes one of the best initiators in the game: his ultimate is applied to magic Immune units and can move them in any direction during thee seconds. Drenches an area in sticky oil, amplifying damage from Batrider's attacks and abilities and slowing the movement speed and turn rate of enemies in the area. Additional casts of Sticky Napalm continue to increase damage, up to 10 stacks. The extra damage is halved against creeps. Hurls an explosive cocktail that explodes when it reaches the target location, knocking back and dealing damage to enemies in the area. Batrider takes to the skies, laying down a trail of flames from the air. The fire damages any enemies it touches, and destroys trees below Batrider. While flying, Batrider gains unobstructed movement and vision. As we have said before, it was the fifth pick and it happened so for a reason. Rapidly examining the pick, you can easily notice a quite mobile Io + Tiny combo and the AoE control absence of the rival's choice. In addition to this, PRIES' pick was aimed at team fights: all heroes of the team's lineup show do way better in team fights than in the single combats. In such a situation the choice of a solo disabler seemed more than smart. We shouldn't forget the fact that it was Shachlo to play Batrider in this match and that is one of his signature heroes. The character itself is not a star in the current patch. Nevertheless, his standstill period has been running for a long time — his peak of popularity was at The International 2013 and after that it's been forgotten. 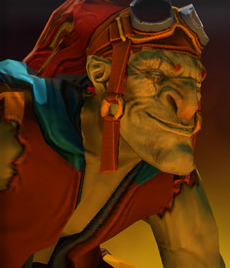 Thus, during The International 2015, beginning from the qualifying stage to the grand final, Batrider entered the battleground only two times. The reason of its unpopularity is that it's been getting worse and worse since the 6.81 version. The ultimate's cooldown was increased, damage from Firefly was degreased — this and other nuances have way weakened the hero. The main target of Batrider in that draft was to destroy rival's formation and catching lit enemy heroes. Both the skill build and item were aimed at that: Shachlo was getting items that increased his mobility. As the conclusion, Batrider is far from being a unique character with such a role on the map. In his times Team Secret would experiment with such a hero as Bane who is also able to hold a target on the place for a long time. In addition to this, his ultimate is applied to magic immune units. Beastmaster is doing well with this roll as well, and the captain is the one to decide which of them to pick for a certain line-up.